is a common reason women see their doctors. Abnormal bleeding can occur at any age of life and has many causes – some are easily treated, while others are more serious. provider is the first step in evaluating this problem. Your care provider will ask about the changes that are occurring, how long the changes have taken place and what other symptoms you may be experiencing. They may also ask about you medical and surgical history, family history, pregnancy history, sexual history and any possible use of drugs, including tobacco. Your care provider will also perform a physical examination from head to (almost) toe. When conducting a pelvic exam, the doctor is checking for evidence of pregnancy, infection or any structural causes of uterine bleeding. A pap smear is included if you have not recently had one. A biopsy of the lining of the uterus can also be done to rule out infection or cancer and may be recommended depending on your risk for these problems. Further evaluation also includes blood tests. Checking for anemia, infection, vitamin deficiencies and other hormone imbalances can help in the diagnosis as well as management of abnormal bleeding. Evaluation of the inside of the uterus may also include hysteroscopy. Hysteroscopy is a procedure which involves looking into the uterus with a camera. There are no cuts made for this procedure and it can often be performed in the office. By directly looking at the lining of the uterus and cervix, a physician can identify a polyp or a fibroid or other abnormal lesion. In some cases, it may even be possible to remove such a lesion in the office. While hysteroscopy can cause some cramping, it is generally well tolerated. but it often can and should be treated. For these reasons, women are encouraged to seek care if they are having bleeding concerns. Any woman who has bleeding in menopause should see her doctor for an evaluation. 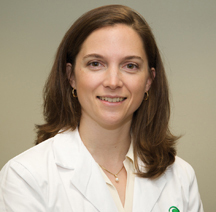 Gretchen Makai, M.D., is Christiana Care’s Director of Minimally Invasive Gynecologic Surgery and a physician at the new Christiana Care Center for Women’s Health. The Christiana Care Center for Women’s Health offers a group of women’s health specialists focused on gynecologic issues that may become more complex for women within and beyond their child bearing years – conditions that can often only be addressed by special consultation, advanced treatment or surgery. The Center for Women’s Health is located at 3706 Kennett Pike in Greenville. For more information or to schedule an appointment, call 302-623-6320 or visit www.christianacare.org/centerforwomen.